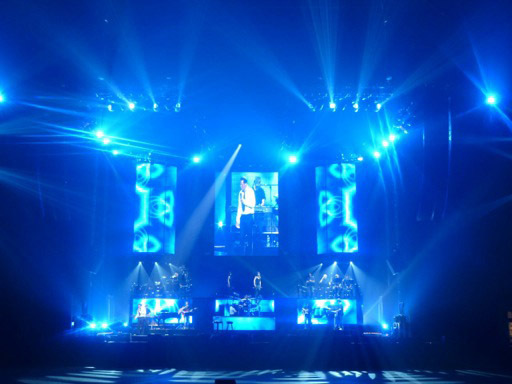 Upstaging is supplying Martin Professional’s new, award-winning MAC Viper Profile automated spot fixture for Latin music icon Luis Miguel’s current world tour, which sees the Grammy Award winner on the road until June 2013. Lighting and show designer is Dave Maxwell who was shown the 1000 W profile fixture by John Huddleston of Upstaging a few weeks prior to production rehearsals. The Viper Profile’s all new gobo artwork from two 5-slot rotating gobo wheels plus an FX wheel with 4 gobos and 135° animation effect give designers an array of fresh graphics to work with. “I also like the soft start from stop to moving on the animation,” Luis says. The MAC Viper Profile is the first fixture in Martin’s 1000 W MAC Viper family of automated luminaires. It is quickly finding a spot on riders across the touring industry thanks to 26,000 lumens of power that make it brighter and more efficient than 1200 W fixtures with a smaller form and lower weight. It won an Award for Innovation at the recent PLASA trade show in London where it was hailed as “a new benchmark for automated lighting spots."